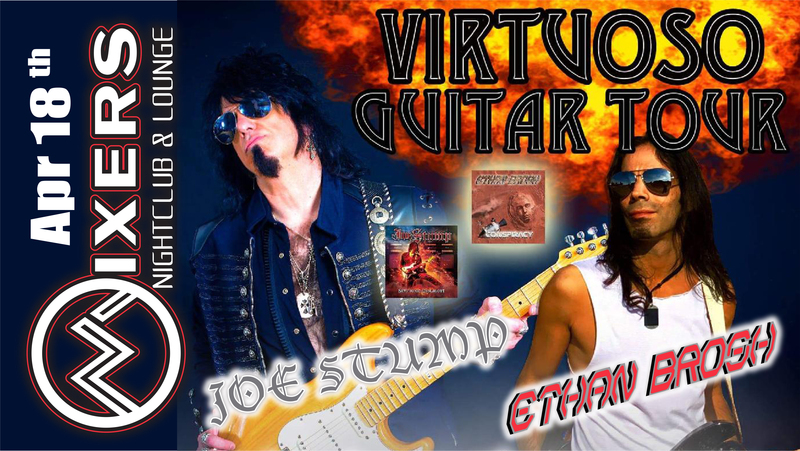 Virtouse Guitar Tour with National Guitarist JOE STUMP & ETHAN BROSH both bring there bands , Live at Mixers April 18th Tickets will be 15.00 in advanced and 20.00 day of show . Joe Stump (born September 18 , 1960) is an American guitarist and composer. He plays neo-classical metal, in a style similar to that of Yngwie Malmsteen. He has released albums with his band, Reign of Terror and as a solo artist. Stump is a professional shredder,and Guitar One Magazine voted him 6th position among the Top 10 fastest shredders of all time. Stump has taught for many years at the Berklee College of Music in Boston. Ethan is a young rock guitar player who leads The Ethan Brosh Band as a national touring act. In addition to recording and touring with his own music, Ethan sometimes steps into playing for high profile musicians as a session guitar player who can replicate other people’s music in the most accurate way while adding lots of energy to it on stage. Between 2013-2015, Ethan toured with a great number of acts such as Yngwie Malmsteen, Jake E. Lee, Marty Friedman, Michael Schenker and many others. In 2013, The Ethan Brosh Band was the direct support act for Yngwie Malmsteen on a major 25 show tour, while in 2014-2015 they did a couple of tours with Jake E. Lee’s Red Dragon Cartel in support of Ethan’s second album, Live the Dream. Between the tours performed with his band, Ethan played guitar for Carmine and Vinnie Appice and went on the road with them, which resulted in a live record called Drum Wars Live!, released on Cleopatra Records. In 2015, Ethan played guitar for the band SteelHeart in South Korea opening for the Scorpions, and acoustic guitar for Eric Martin of Mr. Big.